MS stands for Multiple Sclerosis; it is a chronic, neurodegenerative disease that affects the Central Nervous System (CNS). MS affects more young adult Australians than any other neurological condition. The body’s own immune system appears to attack the protective sheath of fatty protein, called myelin, which surrounds the nerves in the brain, spinal cord and the optic nerve. An attack results in inflammation and development of one or more lesions, resulting in scarring or sclerotic plaques, forming on the nerves. These lesions interfere with the nerve messages sent back and forward through the brain, and spinal cord. Every person diagnosed with MS will experience it slightly differently, depending on the location, size and number of lesions formed, and the type of MS. For some, sensations are altered while others experience difficulty with muscle strength and movement. Lesions in the brain can affect a person’s capacity to process information, and affects their emotions. MS was first described by French neurologist Jean-Martin Charcot in 1868. Yet, after more than 140 years of research into the disease, much remains a mystery. There is no known cause, and as yet, no cure. However, there are treatments that can slow the progress of the disease and manage the symptoms, and new research is expanding our understanding of this unpredictable illness. WHAT ARE THE MAIN SYMPTOMS OF MS? Fatigue: a debilitating kind of general fatigue which is unpredictable or out of proportion to the activity. Fatigue is one of the most common (and one of the most troubling) symptoms of MS. Visual problems: blurring of vision, double vision (diplopia), optic neuritis, involuntary rapid eye movement, (rarely) total loss of sight. Balance and coordination problems: loss of balance, tremors, unstable walking (ataxia), giddiness (vertigo), clumsiness of a limb, lack of co-ordination, weakness (this can particularly affect the legs and walking). Spasticity: altered muscle tone can and muscle stiffness can affect mobility and walking, spasms. Altered sensation: tingling, ‘pins and needles’, numbness (paraesthesia), burning sensations. Pain: muscle pains, facial pain (such as trigeminal neuralgia), stabbing sharp pains, burning tingling pain. Abnormal speech: slowing of speech, slurring of words, changes in rhythm of speech, difficulty in swallowing (dysphagia). Bladder and bowel problems: bladder problems include the need to pass water frequently and/or urgently, incomplete emptying or emptying at inappropriate times. Bowel problems include constipation and, infrequently, loss of bowel control. Sexuality and intimacy: impotence, diminished arousal, loss of sensation. Sensitivity to heat: this symptom very commonly causes a transient worsening of symptoms. Cognitive and emotional disturbances: loss of short-term memory, loss of concentration, judgment or reasoning. Whilst some of these symptoms are immediately obvious, others such as fatigue, altered sensation, memory and concentration problems are often hidden symptoms. These can be difficult to describe to others and sometimes family and friends do not appreciate the effects these have on the person with MS and on employment, social activities and quality of life. The course of MS is unpredictable. Some people are minimally affected by the disease while in others the impact of the disease is more severe, resulting in swift progress towards disability. Although every individual will experience a different combination of MS symptoms there are a number of distinct patterns relating to the course of the disease. Relapsing-Remitting MS is the most common form of MS. Approximately 80% of people diagnosed with MS in Australia will be diagnosed with Relapsing-Remitting MS. 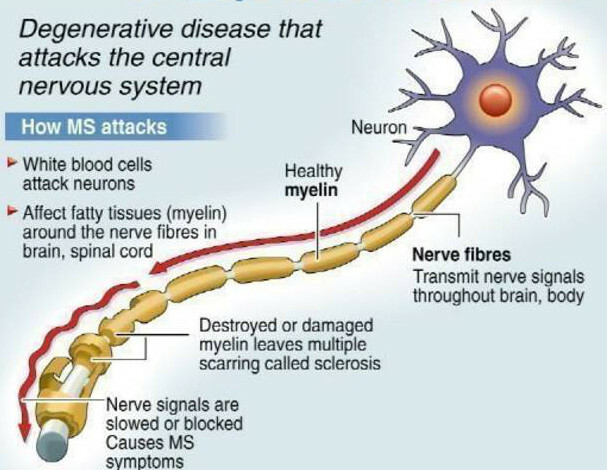 This form of MS is characterised by unpredictable relapses (exacerbations, attacks) during which new symptoms appear or existing symptoms become more severe. This can last for varying periods (days, weeks or in some cases months) which is followed by partial or total remission (recovery). The time between relapses varies. For some their MS may be inactive for months, for others even years at a time. In certain cases, over time, MS people with Relapsing Remitting MS can progress to Secondary Progressive MS. In this case there is progressive development of disability often with superimposed relapses. In primary progressive multiple sclerosis, symptoms continually worsen from the time of diagnosis. There are no well-defined attacks, and there is little or no recovery. Between 10% and 15% of people with MS have primary progressive MS.
People with primary progressive MS are usually older at the time of diagnosis — an average age of 40. Roughly equal numbers of men and women develop primary progressive MS. In other types of MS, women outnumber men three to one. Primary progressive MS usually leads to disability earlier than relapsing-remitting MS (see below). Perhaps the most upsetting difference in primary progressive MS is its poor response to treatment. So far, no treatments have been shown to help, although studies are ongoing.